Steven Curtis Chapman has become a true legend in the Christian music industry. With over 44 Dove Awards, including 7 male vocalist of the year awards, plus 4 Grammy awards and numerous other accolades, he has truly mastered his craft. 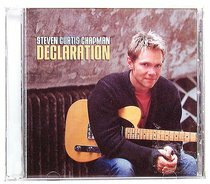 DECLARATION brings together 13 songs that celebrate the love of God, the joy of salvation, and perseverance through trials. SPEECHLESS showed Steven's obvious talents to the world - DECLARATION shows that he is only getting better. With more than ten million records sold in a career that began in 1987, Steven Curtis Chapman has recorded fifteen projects with Sparrow Records. He's received five GRAMMY awards, an American Music Award, 50 Dove Awards (more than any other artist to date), has recorded 44 no. 1 radio hits as well as numerous other honours. His platinum and gold albums include: Speechless, Heaven In The Real World, Declaration, Greatest Hits, Music Of Christmas, Signs Of Life, The Great Adventure, More To This Life and For The Sake Of The Call.- Publisher.